Born to Sparkle can make the impossible, possible. With stencils, glitter and determination the sparkle crew can glitterize your event! Over the weekend Born to Sparkle were sprinkling their pixie dust from Fremantle, to Margaret River and across the ocean to Wadjemup/Rottnest Island. If you were to follow this shimmering trail your destination would be the WA leg of the SummerSalt Festival. What better way to start your summer than with some classic tunes from The Cat Empire & Xavier Rudd, with a cold beverage in hand and the sand between your toes? And let’s not forget one more essential ingredient! SPARKLES! Glitter Glam also wanted to know about the first song Xavier had ever written, and who he shared it with. Given the history of Rottnest/Wadjemup it was also interesting to get Xaviers perspective on what it felt like to perform there, as an indigenous man (Wurundjeri). Glisten under the sun with your own unique, customized temporary glitter tattoo! From just $3 you can choose your design and colour & let the sparkle crew work their magic. Hundreds of punters lined up on Saturday in Margaret River and on Sunday at Wadjemup/Rottnest Island for their own sprinkling of magic. A perfect stop at SummerSalt for a quick refresher between the bands and bevs’. The weather was perfect; overcast with a cool sea breeze gently tickling the sun-bleached hair of festival goers. The salty air, cool lapping ocean and barefoot patrons made for an ultra-relaxed vibe. A perfect introduction to summer. Born to Sparkle was one of just a handful of stalls at Margaret River and Hotel Rottnest over the weekend. People of all ages lined up for the magic touch of the sparkle crew, many delighted punters coming back for a second or even third shining souvenir. 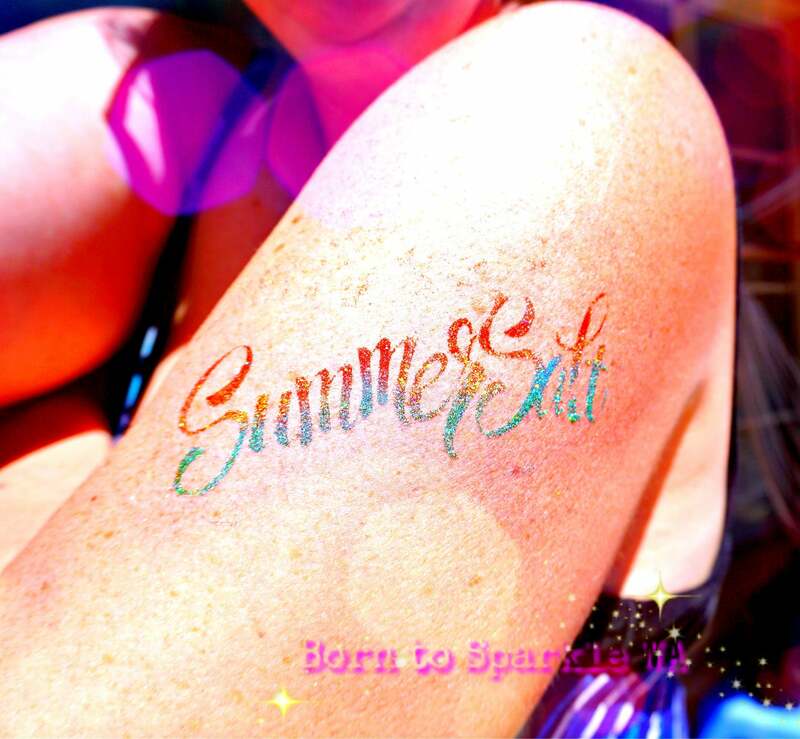 For SummerSalt 2017, Born to Sparkle whipped up a custom tattoo ensuring that Cat Empire, Xavier Rudd, Emmanuel Jal and Lucy Peach fans could savour this musical experience for that little bit longer. Born to Sparkle offer a diverse range of designs but can create unique tattoos for special events-just like this one-to compliment your experience. The sparkle crew are no strangers to special requests! Over the course of SummerSalt customer requests included gun metal grey pirate swords, rainbow unicorns and a black, yellow and red heart encasing a musical note as a sign of respect to our first nation people. Glitter is not just for the girls, as several men popped their glitter cherries at SummerSalt, enjoying the sparkle life just as much as the ladies. In fact the sparkle crew were given creative license on some occasions which resulted in some very creative, shimmery faces. A notable customer that entered the Born to Sparkle tent was a 9 year old Judo champion. He requested an ombre green snake, a silver sword with red diamonds on the handle and an upper arm yin & yang symbol. This demonstrates there is something for everyone at Born to Sparkle. The ‘Glitterati’ specialize in temporary tattoos and glitter make up artistry. If, like some of the SummerSalt fans, you and your bestie would like rose gold brows, a half-moon of turquoise around your eye or a pink glittery pout Born to Sparkle is on hand to help. Born to Sparkle can add a touch of glamour to your next event, whether it’s a children’s party, hens’ night or corporate function. Who wouldn’t want a mermaid brightening their day with her twinkling trail?